As a group, The Nonce always stood out for a number of reasons. As a duo out of Los Angeles, they stayed away from the more popular sound of the time. In fact, you could probably slide a Nonce tape right next to the Pharcyde although they were a little more on the serious side behind the mic. Coming from the Goodlife/Project Blowed collective, they had the reputation for bass heavy and jazzy production under distinctive true school rhymes. The duo would eventually lend their signature sound to other L.A. artists such as Superb, Ganjah K, AceyAlone and the High School Dropouts. The Nonce consisted of Nouka Basetype (aka Sach) and Yusef Afloat. Both were active as a duo in the 90s (releasing material from 1992 to 1999.) Their first release was the single titled "The Picnic Song' in 1992. The track was actually a more friendlier possibly De La Soul inspired track. Take one look at the cassette cover and you can see what I'm talking about. It wasn't until 1994 when The Nonce got their break. That was the year that they dropped the classic anthem "Mixtapes." In comparison to their debut single, Mixtapes was more of a true school joint paying respects to DJ and cassette tape culture. Even the cassingle cover drew references from old Blue Note jazz covers. Who knew that a song about graduating from the turntables to the microphone would have become a radio hit? Only in the 90's could something like that happen. The other single was called "Bus Stops." A real smooth bass driven groove with warm keys against a jazzy horn that comes in on the one. This time you had Yusef on the hook almost whispering "They on the bus stops, they out bumpin' the sound, they at every mall in the city, take a look at 'em cruising around..." This was kinda like The Nonce's equivalent of Tribe's Bonita Apple Bum. The video was brilliant. Timeless frames of Los Angeles in Black and White. All of this is witnessed from the inside of a colorful public transit bus full of honeys of all flavors. Throw in a cameo from Aceyalone and now you got a video that's untouchable. Fast forward a few years and Sach continued to stay active. In 1998, he dropped a cassette only album titled "Seven Days To Engineer." The follow up came in 2002 with the "Suckas Hate Me" LP on Mary Joy. The last project he dropped was his 3rd solo release: Sach 5th Ave. Since his days with The Nonce, his production was featured on a multitude of LA Underground albums from artists like Medusa, Freestyle Fellowship and Global Phlowtations to name a few. Yusef Afloat has a few appearances since The Nonce. His wordplay is featured on tracks titled "Like It's 1999" off of Jizzm - Archives as well as "Look At Me Mean" from DJ Rob One's West Koast Indie's Vol. One Mixtape. His last release was the Hard Times EP which even the just the titles of the songs (Possessing Evil, Dancing in the Dark) show a darker moment in his life. On May 21st, 2000, Yusef Afloat was found dead alongside the 110 Freeway in Los Angeles. Not much is known about his death. In the Goodlife/Project Blowed documentary called "This Is The Life" there are segments where some of LA's underground luminaries give their accounts of the way Yusef lived and even some details about his last moments alive. Aside from the mystery of his death, we can only imagine what Yusef could have contributed to Hip Hop today. There's no question that this duo left a huge foot print on Hip Hop. Check the following interview to hear what they duo has to say about classics and their take on the future of Hip Hop. Their views only add to the legacy. It would be a shame to have a blog called Strictly Cassette and not mention The Nonce. Definitely one of my favorite groups of all time. This was dope, ill be honest i didnt really know much about the group besides the music, & of course world ultimate being the classic album everyone refers to but i also have their later music & mixtapes which are dope but nothin like w.u... So after readin this i know more about the men behind the music & the mixtapes!! Much props for this review, The Nonce was/is/will be also one of my favorite groups ever. 2016 .still sound in the studio/Buenos Aires, Arg. Thank you for this!!! The Nonce is one of my all time faves. Wish there were MUCH more features on them floating around. They definitely deserve the ink… having helped shape so much of the GL/PB, west coast sound. I'm glad to see Sach still being productive… on both the mic and the production tip. Such a talent… carving out his own sound and style. And man!! Imagine if yusef was still around.. and on that sach 5th album with omid?!?! Whew. This is dope!! 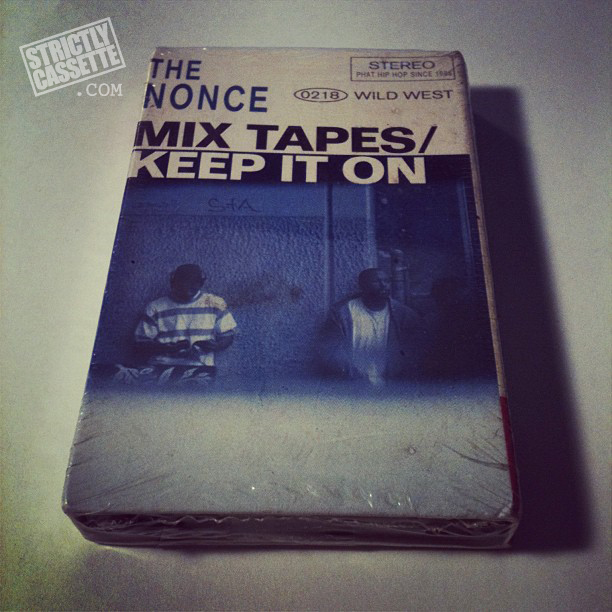 Got's too admit didnt know much about The Nonce Besides their music well said Strictly Cassette! Big ups!! Well detailed feature like always. Its priceless knowledge like this that makes S.C obsolete salute fam! Final got around to checking the blog after following your post on instagram, glad I did. Out here in Australia you didn't get that many Hip Hop video clips back in the 90's especially ones that weren't the latest top 40 track or the more mainstream hip hop joints, however The Nonce slipped through the radar and we were lucky enough to get "Mixtapes" on regular rotation. Unfortunately I never copped the album back then and will have to keep searching bargain bins the world over looking for a cheap copy of World Ultimate on vinyl. Will peep the rest of the videos and share via my FB page. I look forward to reading more of your articles. Love this piece and this site!Its dope to see the cassette singles still wrapped...I have jewell drop of The Nonce from The Wake Up Show back in the days.Loved this group. For sure man, cool to see other people out there recognize these guys. World Ultimate was and still is extremely solid. And what does that mean? It means punks get steamed!